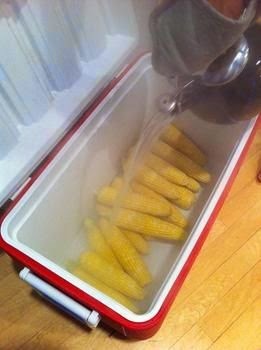 No this corn isn't really any cooler than other corn but the method of preparation sure is. Just got an email with this fabulous idea for cooking corn on the cob. This will work great for our potlucks and gatherings at Hidden Valley because it makes lots at once and keeps it hot (but not mushy) for a long time. Don't know if this qualifies for RV Gourmet status but it sure tastes great and makes quick and easy work for whipping up a load of cobs. I tested it out and am reprinting the recipe and notes just as they came to me in the email. As an obsessive food nerd, you'd expect that I would have at least heard of it, but over the weekend I was blindsided by the simple genius of this method for cooking loads of corn on the cob perfectly. I was hepped to it while visiting my family in Maine. We like corn on the cob. And with eight adults at the table, that means a couple of dozen ears. We would have used the lobster pot to cook them all, but the lobster pot was busy steaming lobster.Then my sister, a capable Maine cook with years of camping experience says "let's do cooler corn!" Before I can ask "what is cooler corn?" a Coleman cooler appears from the garage, is wiped clean, then filled with the shucked ears. Next, two kettles-full of boiling water are poured over the corn and the top closed. When we sat down to dinner 30 minutes later and opened it, the corn was perfectly cooked. My mind was blown. And I'm told that the corn will remain at the perfect level of done-ness for a couple of hours. Turns out, Cooler Corn is pretty well known among the outdoorsy set But for those of us who avoid tents as much as possible, it's perfect for large barbecues and way less of mess than grilling. In fact, I may even buy another cooler just so I'm ready for next summer. Now that I'm in the know. Just an added note for corn of the cob add ons. Our favorite is butter with chili powder sprinkled on.